The Docter Monocular — Have You Ever Seen a Folding Monocular? The Docter monocular first came to our attention through a YouTube video we saw. You've probably noticed that a good quality monocular is not always easy to find and when we heard about this one we paid attention. We were intrigued by the concept of a Porro prism monocular design that could be "folded" to use it or "unfolded" to lay flat for ease of carrying. We started digging for information to learn as much as we could and see if the design was actually as good as the video said it was, since it sounded entirely too good to be true! 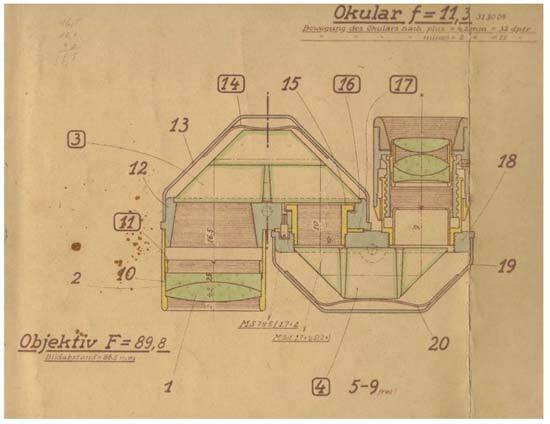 We found that the folding Porro prism monocular was actually a bit of optical design genius by the Carl Zeiss Jena Company back in 1921. It has always been available in the 8X21 configuration. Whether it's simply legend or truth, it's believable that this monocular design has been used for espionage work. It is a "spy glass" in every sense of the term — being quite easily concealed in the hand when folded for use. Given the quality of its optics and design, it would be perfect for that sort of thing. An old Carl Zeiss Jena Turmon monocular can still be found on Ebay.com from time to time and they're sought as classics. Although they don't have modern anti-reflective lens coatings, the price for one in good condition is usually at least $150 and often higher. With all these things running through our minds, we contacted the company in the United States that's now importing them from Germany and ordered one. We figured that it might be a gamble, but the our research made us feel it wasn't likely to be much of a gamble since it was still being produced after first being introduced in the early 1920s! Oh, we saw the knock-off folding monoculars for much less, but, like you, we learned early on that you don't get something for nothing and we decided we'd go with Docter for a reason. What was the reason? Docter is the company that evolved after World War II and the separation of West Germany and East Germany. Docter kept up the manufacturing and would be the natural successor to Carl Zeiss Jena. We expected quality from this German optical company and, from what we'd found so far, we didn't think we would be disappointed in the Docter monocular. 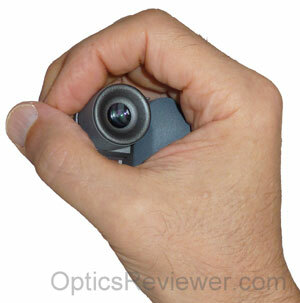 We were delighted when our new monocular arrived in time to take it to a convention in Florida. We figured it would not only be nice for exploring the city, but we were going to be attending the conference with over 2,300 other people and we might not always get front-row seats! It took very little time to get used to holding and focusing the Docter monocular. When the pocket-sized monocular was lying flat and we looked through it, we found that we could see everything very well, only upside down. It's the "folding" of the monocular that positions the prisms properly to invert and deliver that image to our eye as we would expect to see it. The fact that it's able to be "unfolded" is what allows it to take up as little space as it does. When in its leather carrying case, it's readily carried in a shirt pocket or handbag until needed. Where is the Docter Monocular Made? We contacted Docter staff to find out more about this little beauty that's stood the test of time. One thing we wondered about was where the Docter monocular is manufactured. The one we bought didn't say anything about where it was made on it and pictures we've seen of others always had "Made in Germany" inscribed on the side. We learned that they have a manufacturing plant in Eisfeld, not far from Jena in Southern Thuringia. That's pretty much in the middle of Germany. They've been making the Docter 8X21 monocular in that manufacturing plant since about 1970. What is available now is a slightly more refined design that's been produced since 1992. What About the Monocular's Optics? The fact that the Docter Monocular uses a Porro prism means that it doesn't need a reflective coating or phase corrective coatings as do roof prisms. 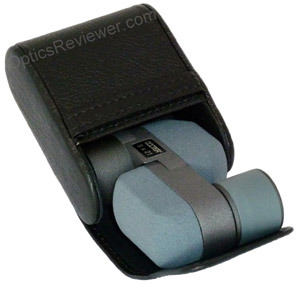 That and the fact that the prism is made of BaK-4 glass and is fully multi-coated means that the light transmission is above average for pocket monoculars and the both the colors and resolution of details are phenomenal for such a small device. We wondered why information like this wasn't readily available on the Docter web site and the answer was wonderful: "Sorry, but this is the most natural thing in the German optical industry. That's why it's not mentioned." We love to deal with people who feel that quality design and craftsmanship is normal and nothing to brag about! Typically, a Porro prism needs a little more protection from being dropped or bounced around than a roof prism design does. Also typically, a Porro prism costs less to manufacture and, because of that, it doesn't cost as much as a roof prism would. In exchange for taking care of the little Docter monocular, we found the price is about $135 from Amazon.com or at least $65 less than a roof prism monocular of comparable quality. How much extra care? It's not difficult. We have a small plastic box (some have used a travel soap box) that we slip it into after having wrapped it in bubble wrap packing material. When we're on a plane, we simply slip any optics we're traveling with into a pocket or hang them around our neck to reduce the vibration for them. Is the Docter Monocular Waterproof? When we felt the Docter monocular in our hands, we thought perhaps the body was machined from cast aluminum. We were wrong. The folks at Docter told us that it's actually made of glass filled polycarbonate that gives the surface a texture similar to cast aluminum. It's quite a pleasant device to hold in the hand. Since our Docter monocular only weighs 2.8oz (80g) and the body is polycarbonate, we have to assume that most of the weight is in solid, optical grade glass. 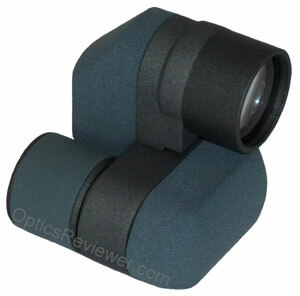 This monocular has a field of view worthy of larger optics at 361ft at 1,000yds (110m at 1,000m). As we tested and worked with our tiny Docter monocular, we were reminded again and again that it was an extremely well-designed, precision optical instrument — no matter how small or lightweight it was. We found that the area in the center of the Docter monocular's field of view where the focus was sharpest extended out from the center to about 57&percnt; of the field of view's radius. At that point the details started to soften, nearly imperceptibly at first, until at about 71&percnt; of the radius, when they started to blur noticeably. 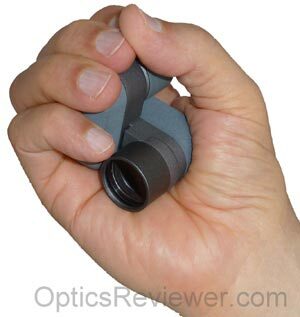 This is a very nicely sized sweet spot for such a small monocular! As such, we found our tiny Docter to be very comfortable to look through for extended periods of time. Of course, using one eye isn't the same as using both, but we're focused on affordable, small, lightweight optics and this precision optical instrument is extremely good. It's a good example of what you get when research and development are properly funded and coupled with a corporate commitment to quality. The Docter monocular's resolution of details rivals that of much larger and much more expensive binoculars. Some have misunderstood the nature of Porro and roof prism designs and said that this monocular lacks phase correction coatings. Phase correction coatings were popularized during the 1990s to increase the resolution of roof prisms so that they would be comparable to Porro prisms in that regard. Porro prism optics, such as the Docter monocular has, do not need phase correction coatings to improve their resolution of details. We found the unit we bought and tested to be excellent in low light conditions. The roof prism optical designs in vogue today typically require a high quality reflective coating to be able to function well in low light and approach the capabilities of Porro prisms. The best reflective coating available for roof prisms today is the dielectric coating, which adds to the price of roof prism optics. You'll likely recall that Porro prisms are designed in such a way that they don't require any reflective coating at all. Larger binoculars and monoculars use mathematically designed baffles inside their barrels to control strong and stray light. Since a pocket-sized monocular such as the Docter 8X21 doesn't have a long barrel, there isn't enough room for a lengthy set of baffles. While its size doesn't provide for a lot of physical control of strong light, we found it relatively easy to adjust our position or stance to take advantage of naturally-occurring shade or to use our hand or hat to shield the monocular. The Docter specifications indicate that their 8X21 monocular is able to focus as close as 6.6ft (2m). Since many of us use a monocular for viewing things at relatively close distances, we measured how close we could come to the item we were observing. We found we could achieve a sharp focus as close as 5.2ft (1.6m) to the object of our attention. You may be wearying of our pointing out the quality of the Docter monocular, but this is another indication of the quality of its design. As long as we're talking about focusing, we'll add that we only had to turn the focus adjustment a tiny bit more than one full revolution to go from close focus to infinity. This means that we were able to focus quickly and smoothly when changing our viewing distance. More than a single revolution means spending more time and energy focusing than is necessary. Less than a full revolution usually means that it's difficult to achieve a fine focus and we wind up fiddling with the focus adjustment and miss things that we really wanted to see! We enjoy the three dimensional view available with Porro prisms and prefer those roof prism designs that provide at least a little bit of that depth of view. A big reason for this is that we don't have to keep adjusting the focus every time we change our viewing distance by a small amount. Another reason is that we simply enjoy the three dimensional view. In talking with others, we find that we're not alone in that enjoyment! When we received our diminutive Docter monocular, it came in a small container that served to emphasize the fact that it's not very large! It came with a well-crafted leather case that into which it fit very nicely. The flap does not use Velcro that will deteriorate with use, as so many do today, but instead simply tucks under a strap for a classic closure. Also included with the instrument were instructions on how to use the monocular and warranty card. Where else can you get an innovative Carl Zeiss optical design that has stood the test of time since 1921, with updates and upgrades as technology improved? 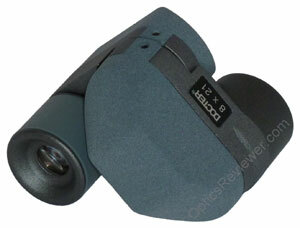 As we tested the Docter monocular, we were amazed again and again at the optical and build quality for the price. The Docter modesty in thinking simply "this is how they should be made" was pressed home to our minds as the likely reason why more people aren't aware of the quality and value of this monocular. Shop for the Docter monocular at Amazon.com (USA) . For our friends in the UK, we recommend shopping at Amazon.co.uk . At its present price, we think it's a steal! There's also a pink-ish/lavendar/purple one available in the United States for those who would prefer it over the gray model. 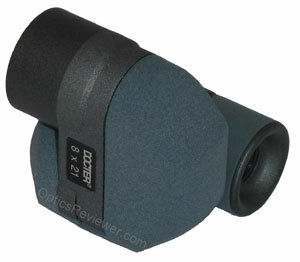 We've highly recommended the Docter 8X21 monocular to our friends and colleagues. It's an excellent optical value for which we would expect to pay at least twice as much if purchasing it in a roof prism design. In fact, we're restraining ourselves so you'll not think we're going overboard because we like it so much! The warranty card included with our instrument said that Docter provides a 30 year warranty. They will repair or replace, at their option, a monocular with a defect in materials or workmanship for the first five years after purchase. After that period, Docter will bear the cost of materials. For the excellent quality we got and the very reasonable price we paid, we feel it's a very good warranty. As we dug in and both researched and tested the Docter monocular, we found that the video that caught our attention had a couple of inaccuracies for which we've provided correct information above. You may have found this page by searching for "Doctor 8X21 monocular."